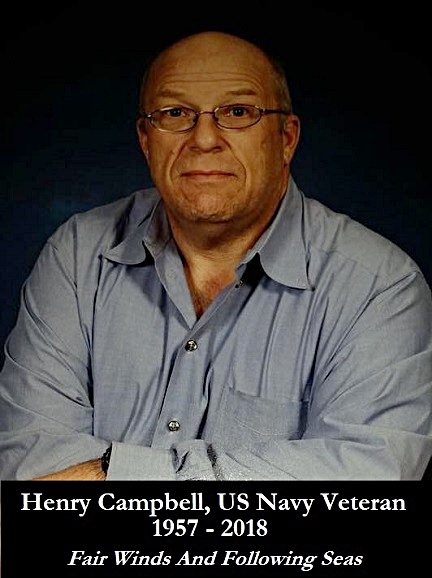 On Tuesday, May 28, 2018 Henry Campbell, a United States Navy Veteran, avid fisherman and dear friend to many who knew and loved him, passed into God's loving hands. Please help us honor Henry and his service in defense of our great nation by offering your words of gratitude for his life and the many people whose lives he touched while on this earth. United Soldiers and Sailors of America - Usasoa is stepping in to provide a dignified funeral and burial for a US Navy veteran, Henry Campbell, who died without having any living relatives or next of kin. As a veteran and military service organization, USASOA could not allow this sailor's remains and his service to our nation be discarded or forgotten. Every veteran deserves to be honored for serving our nation, we could not simply stand by and let his mortal remains be sent off to an Anatomy Board and then discarded into an unmarked grave. At this particular time, we are asking the veteran and military to come together as a family united to ensure that this sailor, Henry Campbell receives Navy honors and a dignified burial. The funeral and interment for Henry will take place on Wednesday, July 18, 2018 at 1 pm in the chapel at the Cheltenham Veteran's Cemetery, 11301 Crain Hwy, Cheltenham, MD 20623. We want to sincerely thank Father Brian Vander Wel of Christ's Church in Accokeek, Maryland for his incredible kindness and compassion at this difficult time. Father Brian will be officiating the funeral service in the Chapel at Cheltenham Veteran's Cemetery. May God in his infinite love and mercy grant Henry, our friend and brother eternal rest and grant him the peace that so eluded him in this world.